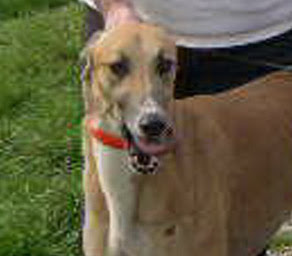 We are very sorry to report that one of our adopters has lost a wonderful greyhound. WV’s Zagnut was the very first greyhound we placed when we started our group in April. We knew Lynne and George Yourick for many years. We met them when they were working for another group that we were working for and which eventually went out of business. We had fostered a dog named Ricky Martin for a very long time. It seemed to take a long time to find him the right home. Lynne and George came along and fell in love with Ricky and adopted him! They gave him such a wonderful home and, at age eleven, he is still going strong. When we established FFGR, Inc. in April 2005, we started off by taking in three greyhounds to foster and find homes for. Zagnut was one of the dogs. We took Zagnut to the Frederick County Humane Society’s Walk-n-Wag in May of 2005. Lynne and George came with Ricky to say hello. They stayed at our tent for awhile and spent some time with Zagnut. They decided to adopt him! Zagnut certainly had the best home of all. Lynne and George are awesome people and loved loved loved their hounds. We always kept in contact with Lynne and George and a couple of months ago got word that Zagnut was not doing well. He was diagnosed with the dreaded osteo and it was only a matter of time. They decided to keep him comfortable and make sure he was doing all right. But recently he went downhill fast so they decided to let him go. I know what a loss Zagnut is to Lynne and George. They are such great people. We’ve known them for over ten years and know that they are the type of people we hope to meet when we try to find homes for our hounds.